In recent years one cannot ignore the almost inevitability of the action movie centered around the strong female protagonist character. They're often male fantasies that just happen to be able to fight well or are handy with a gun. They don't seem to dress with practical considerations in mind and they always look good beating up the bad guys. On the whole it all feels rather simple in approach. Atomic Blonde is anything but that sort of movie, no matter how much the marketing folks wanted to sell it that way based on the initial trailers. Sure you do have a strong female character beating up people left and right, she's a complex character involved in a very complicated web indeed. And she's not exactly a victim in all those or merely pushed around by the plot but she's very much a character with agency and direction. It's not a perfect movie, but it's smarter than most of the trailers would have you believe. And that difference is a lot bigger than you think and it pushes this movie to be a lot more than most. Synopsis: Atomic Blonde is an American spy movie directed by David Leitch. The screenplay was written by Kurt Johnstad as based on The Coldest City graphic novel by Antony Johnston. Before the fall of the Berlin Wall, we are shown the death of MI6 agent James Gascoigne (Sam Hargrave) at the hands of a KGB agent. This was done in order to secure The List, a microfilm containing the identities of all known agents active in Berlin. We jump 10 days to join the interview of MI6 agent Lorraine Broughton (Charlize Theron) to understand how her own operation in Berlin had broken down. Thus the main part of the movie involves reliving her mission to retrieve the list. Her briefing included a warning about a KGB asset known as Satchel, who was believed to be a double agent within MI6. And upon her arrival in Berlin this information seems to be prove correct as she is almost immedialtely attacked by KGB agents before she can reach her contact, David Percival (James McAvoy). What I Liked: It's hard not to compare this movie with Tinker, Tailor, Soldier, Spy given its espionage focus and the fear of a double agent. But the two movies remain worlds apart as this one still has a lot more action versus the former. But don't let that distract you as there's a fairly complicated story in motion throughout the movie and you really need to pay attention in order to stand a chance of figuring the story out. But man, the action is great in a wholly different way and it's easy to get lost in Charlize Theron's abilities in this department. The fight chreography was almost beautifful at times and it's a good thing that Theron was able to deliver the sort of peformance needed for things to be elevated into something truly great. What Could Have Been Better: The similarity of the stories is hard to shake off and at times the determination to make thing a shell game get a little too confusing for comfort. The fact that there seem to be a good number of articles online that all try to explain the ending of this movie reinforces the fact that the narrative may have gotten away from them somewhat. It's one thing to be clever but another to use confusion to obfuscate your mystery. And things got really weird in the middle act as they juggled this and that. The instances of presenting Lorraine's sexuality as another tool in her arsenal did feel a bit indulgent at times but for the most part I guess it still served the movie? 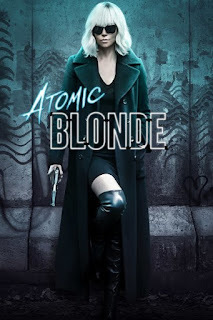 TL;DR: Atomic Blonde is an interesting movie for the most part and one with some great action that helps keeps things going. But the complex story can tend to trip over itself more than once and that adds an odd degree of challenge to watching the movie. Thus the movie gets 3.5 beautifuly kicks by Theron out of a possible 5.